Sigma is the IT solution designed and developed for the complete administrative and financial management, with particular reference to all companies that work in agricultural and horticultural field. Used together with other solutions from the powerful Gtp application range, Sigma forms an efficient and fully integrated ERP system that meets the needs of any business. The word Sigma is an acronym that stands for Sistema Intergrato Globale Modulare Amministrativo (that is, modular global integrated administration system). It is Gesag’s solution to the company administration and accounting, allowing you to analyse all financial aspects of your business, be it a small or a big one. Sigma lets you deal with daily operations quickly and naturally as it was designed and implemented for everyone who wants to carry out the accounting activity with simplicity but in a complete and accurate way and with the awareness of the actual financial trend. Its main features are the modular structure and the full integration with the Gtp range, turning Sigma into a complete and powerful ERP system for the management of all relevant business processes (sales, purchases, inventory, management, accounting, …). Moreover, Sigma is easily adaptable to different business contexts. 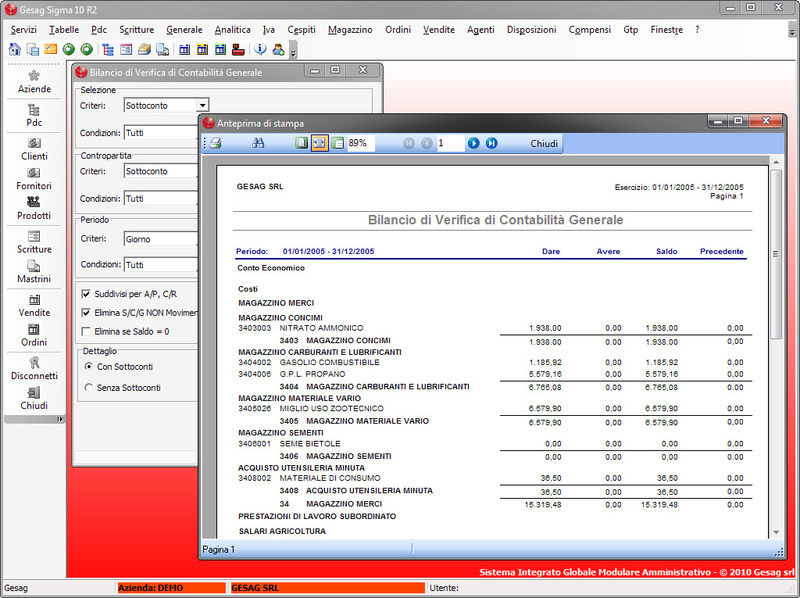 The General Ledger module allows account processing and T-accounts, journals and balances (verification, reclassified CEE) printing in different templates. Deadlines and cash flows management is an effective tool for the company administration in order to understand the company ability to generate liquid assets and meet its own commitments. The aim of the module is the analysis of financial transactions affecting liquidity and the forecast of changes in the financial cash and bank balances over time. 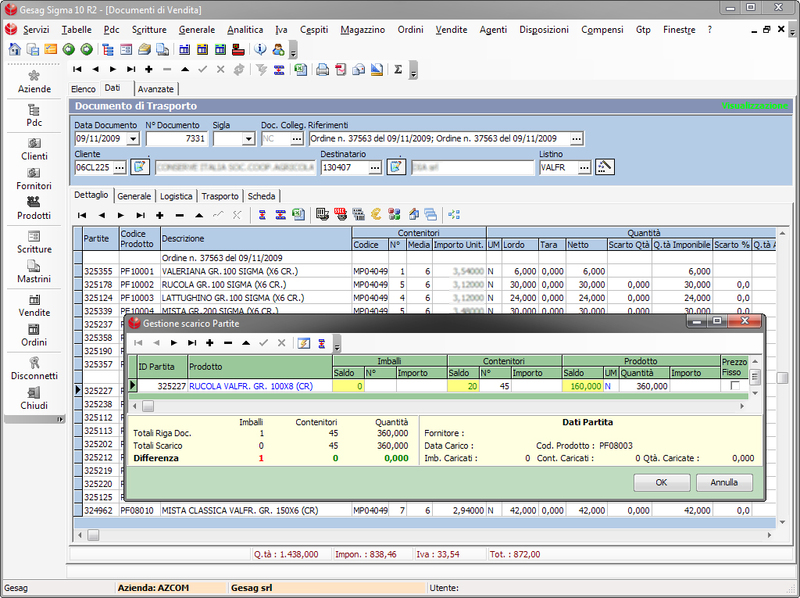 Within the module you can manage customers and suppliers statements, ledgers, payment and receivables analysis, estimated and actual flows and costs analysis. The VAT Accounting module allows the printing of VAT registers and charges (even interim basis), VAT management with deferment of deduction, customers and suppliers list, liquidations and periodic declarations, VAT analytics and liquidations and annual declaration. 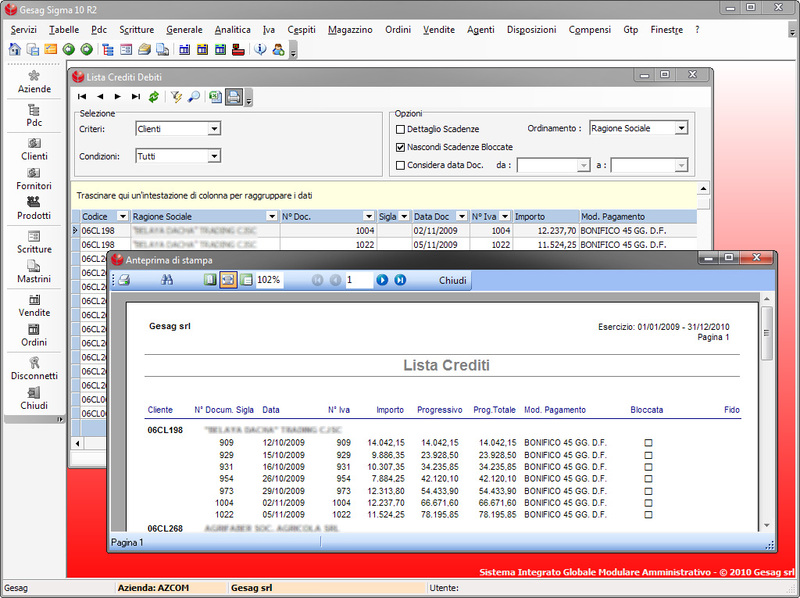 The module also allows to manage, independent from or integrated with the recording of accountancy, data required for the periodic Intra declaration (monthly, quarterly or yearly). In accordance with the ministerial laws in force, it also allows to print the periodic declaration and to generate the corresponding file for its electronic submission. 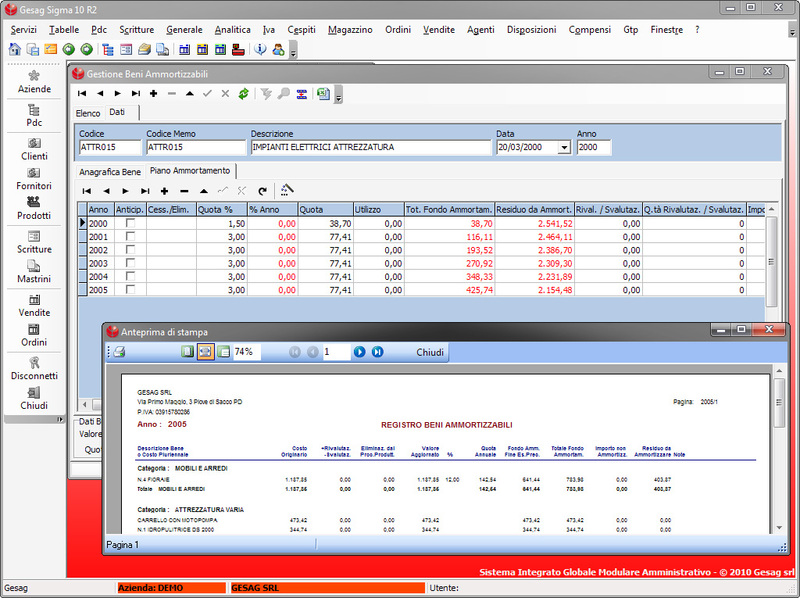 The Analytical Accounting module allows an accounting parallel to the General Ledger. 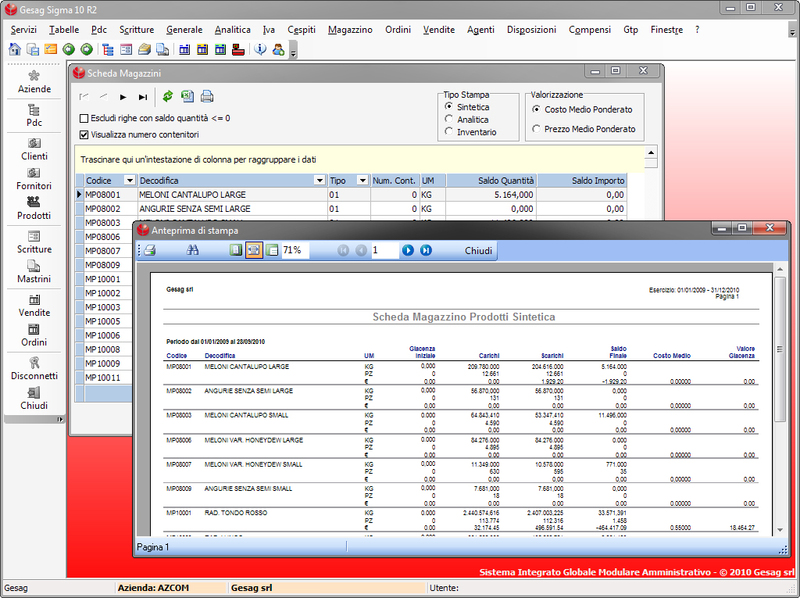 Using the same tools available to the General Ledger and assigning each transaction to a cost center, it is possible to perform analysis, balance the budget (budget for cost center) and manage macroscopic aspects (general profitability) or more detailed ones (e.g. profitability of a single production area). 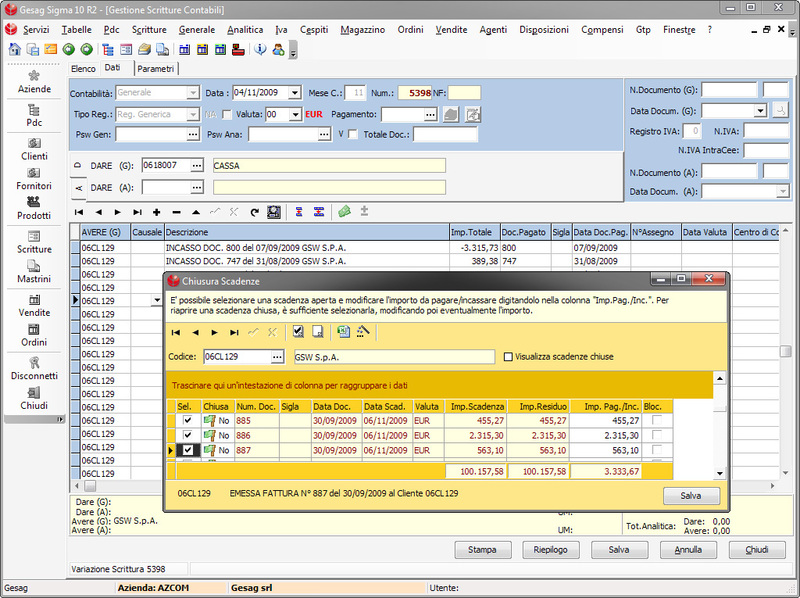 This functionality lets you manage comprehensively goods that are subject to amortization: you can record depreciation schedules, manage all sales transaction, revaluation and elimination, perform analysis and print the corresponding Register of Depreciation. 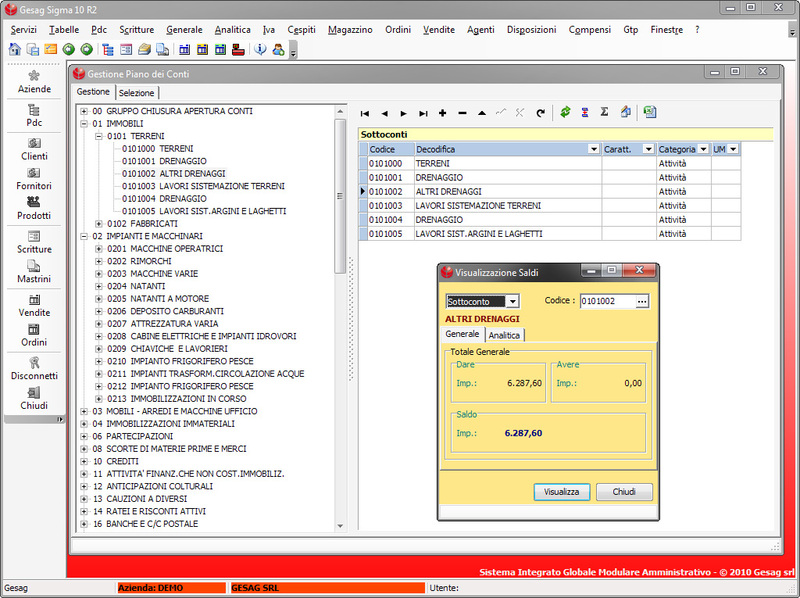 The Warehouse module has been thought for an accurate stock accounting. You can manage stock loading and unloading of raw materials, finished products, packaging and containers, calculate costs, evaluate the warehouse stock and make adjustments. 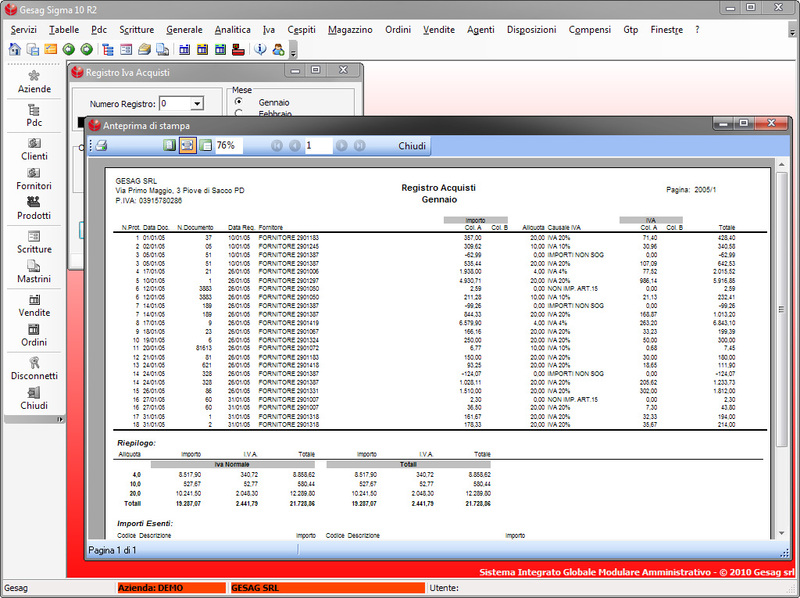 The module automates both the issuance and the management of active bank receipts and supplier payments by bank transfer, including print reports and file generation. 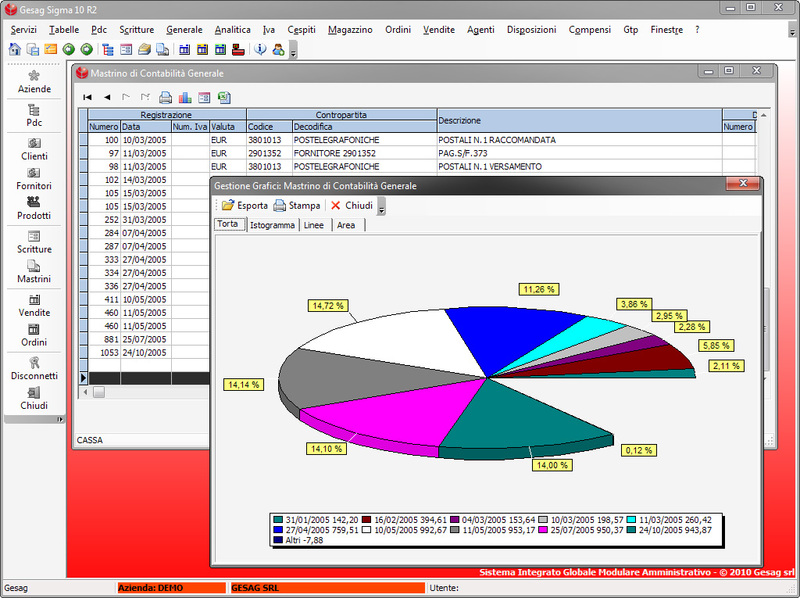 The module performs all the activities needed for the computation and liquidation of commissions, the production of the account stated and the sales analysis. The module allows the management of all operations on the back of the company (as withholding agent) and then automates the transaction of invoices received by professionals and agents, the payment of the withholding tax and the printing of certificates at the end of the year. The movement of the withholding tax is the same as the passive invoice accounting, while payments are the basis for the monthly payment of the withholding tax. 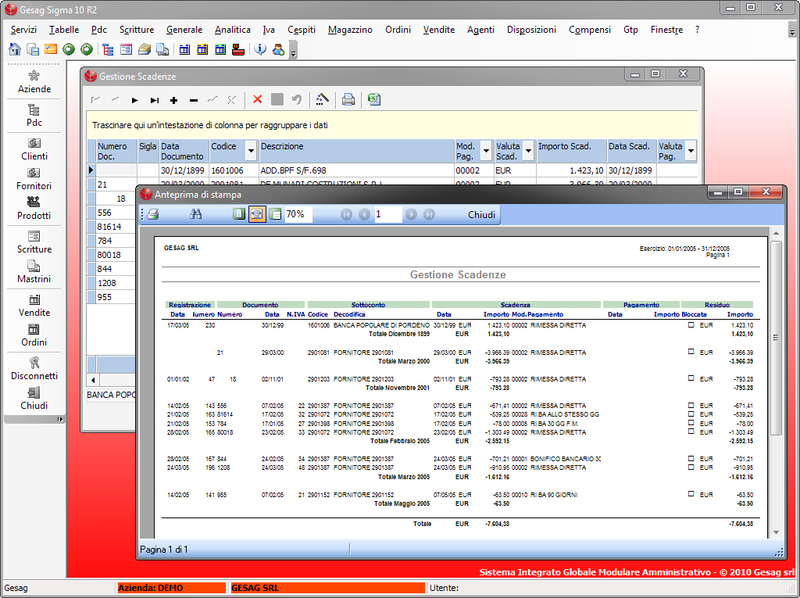 With Sigma the user can scan documents and images and easily link them to a document (accountancy, warehouse load, etc.) or to general identity data (customers, suppliers, etc.) 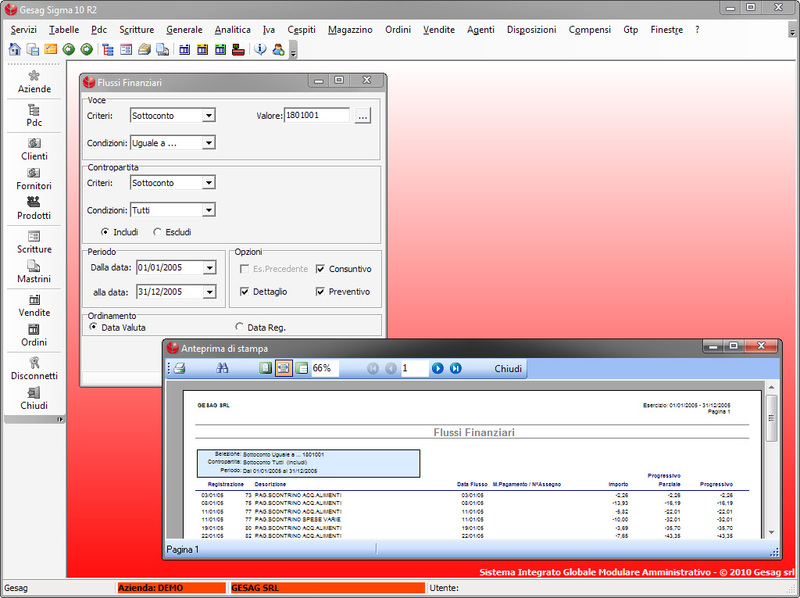 to automate document creation and reduce the number of paper documents. With Sigma it is possible to define authorizations for the use of different modules and to arrange users into groups according to the internal organization of the company. This allows full control on the application system and access monitoring. Moreover, it is possible to freely customize print reports in order to create specific documents fitting different needs. 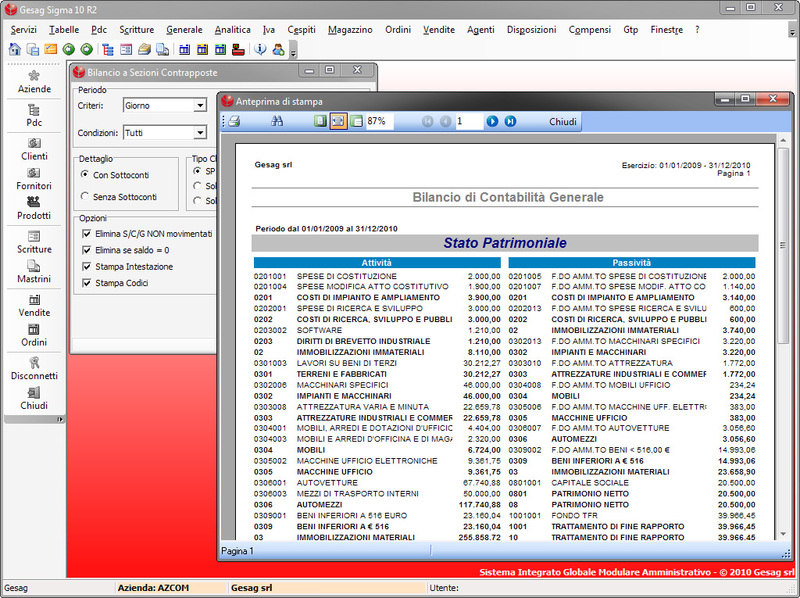 Gesag Sigma can exchange data with Office applications, can be used simultaneously on computers of the same network and be integrated for advanced analysis and statistics. 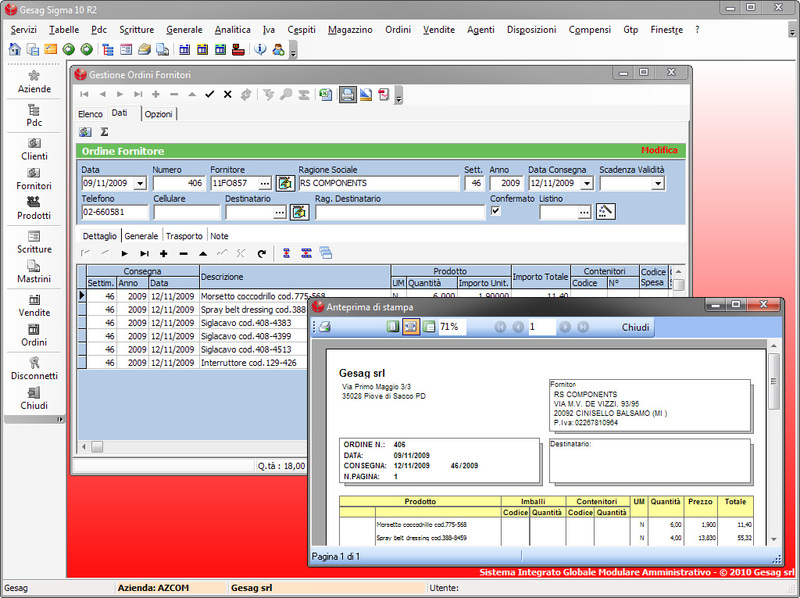 It is designed to interact with modern communication technologies and provides practical solutions for data transfer and synchronization among several corporate headquarters not networked with each other: file transfer (via usb), internet (via ftp), private networks (vpn) or terminal server connection (terminal server or vnc).